Andy Thompson is one of Wolves’ most popular players of recent decades. 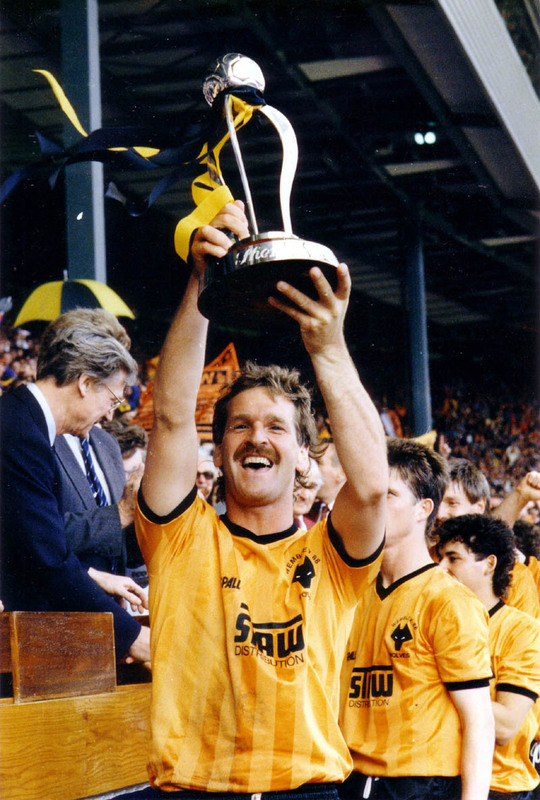 He joined the club at the same time as his good friend, Steve Bull, and together they saw Wolves through a traumatic but eventually successful period. I started off by asking Andy about his current employment, as a teacher, and enquired why he decided to move into that profession. Andy Thompson - a much-loved bundle of energy at Molineux for 11 years. Q: Was becoming a teacher after finishing football something you always had in mind? A: I went back to college mainly for me. I left school with no qualifications apart from my PE, so, just to prove it to myself, I went and did English and Maths GCSE. I enjoyed it more than I thought, especially being out of education for 20 odd years. Surprisingly, I found it a lot easier and more enjoyable than I expected. Probably, it was because I was older and more experienced and you realise you do need something to do after football has finished. I was doing the GCSEs while still playing, then I went to do an evening access course at Cannock College for mature students, which was the equivalent of 2 A levels – in subjects such as history, psychology, science and computers. Again, I enjoyed it. I passed all those qualifications and thought I might as well put them to good use. Someone suggested I do a degree in sport or something like that. I thought it was a good idea, so I enrolled at Wolverhampton University and started doing sports studies. However, after talking to the tutors and some colleagues, they said ‘Why don’t you go into teaching?’ So, I moved from one course to another, and took an education degree, with teacher training straight after it. I actually did a Graduate Teacher Programme, which included being based at a school in Coseley for a year, having hands-on experience of working with children. It was totally different, the kids were quite demanding and I thought it was a good place to test myself to see whether I could continue to do teaching. I really enjoyed it. Now I’m in a full-time position at a large school in Derby, with 1,700 pupils. It’s a senior school taking youngsters from 12 to 18. I have some involvement with the sixth form but am mainly involved with years 7 to 11. At the moment, I am Acting Head of GCSE for the year. This is my third year at the school and I have to say I haven’t been disappointed with any of it. Q: It takes a lot of courage and determination to go back into education, especially as a former professional footballer. Did you get any comments? Bully and Thommo in action amid the early 1990s splendour of Molineux. But it wasn't always like that.....Photo courtesy of Mutchy. A: West Brom had just been relegated from the old First Division, the Premier League as it is now, and I’d played 15 or 16 games for them. Ron Saunders was the manager and, at the start of the season, I was a regular in the first team. But I had a message after training to go and talk to the manager down at the Albion ground. Saunders was walking down the corridor, and he said: “We’ve spoken with Wolves and we’ve agreed terms, go and speak to them,” and walked off! As a 19-year-old kid, I’m thinking: ‘What’s going on here?’ I was gutted at the time, because I’d been at the club since I was 13. When I went to Molineux, it had a nice buzz about the place even though the conditions were terrible. Basically, they were having to start from scratch. However, I’m from Wolverhampton, I’m a Wolves fan and, despite the state of the ground, I thought it was worth a go. I thought: ‘If I’m going to make it, I’m going to make it.’ I was only 19 and, at that age, you don’t look too long-term. All you are looking at are the immediate aims and I wanted to play for my home team. Q: Did it help joining at the same time as Bully and Robbie Dennison? A: Robbie actually came a few months later. Bully and me joined in the November and Robbie followed in March. 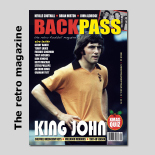 When I was told by Ron Saunders to go to Molineux to talk terms, I was asked to hang on because someone else was coming with me, and Bully came through the door. I suppose it helped joining at the same time as him. I think we’d talked ourselves into signing for the club even before we got to the ground. It was the way Ron Saunders had treated us. 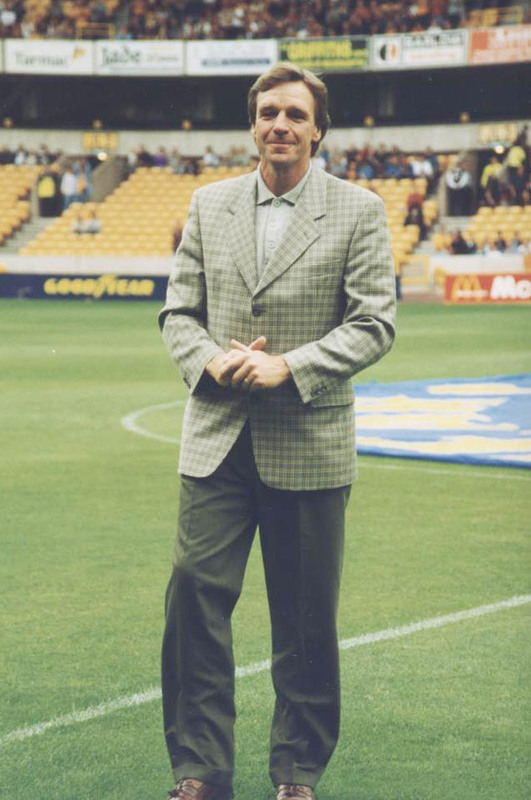 Graham Turner was Wolves’ manager, and the club paid £100,000 for the both of us. Sometime later, last year actually, I found out why Albion had got rid of us so suddenly. I met their former coach, Norman Bodell, and he told me the club were desperate for cash. Albion had some big names who were on big money and Wolves, because of the position they were in, were willing to pay cash up front. I didn’t understand why they sold us originally but now I do. A: Originally, I went to Albion as a centre-forward, then ended up playing in midfield. I did play as wing-back a couple of times, so I had some experience in the role before moving to Wolves. I didn’t mind what position I was in, as long as I was playing. At Wolves, I started off playing in centre midfield or wide midfield. I occasionally played at full-back to fill in because the manager knew I’d played there before. Basically, it got to the stage that I just stayed there. The Sherpa Van Trophy final was in 1988 and I was a permanent full-back by then. A: I was always naturally fit. At school, I took part in all sports. I ran for the county at 1,500m and cross country, and played rugby and football for the school. Fortunately, during my playing career, I didn’t have any serious injuries. All I had were two hernias – one at Wolves and the other at Cardiff. At Tranmere, I had a small spur on my knee shaved off but I’ve not had any serious knee problems such as cartilage or ligaments. Graham Turner....responsible for the crucial double signing in 1986. Q: You mentioned Ron Saunders and Graham Turner. Who were your other managers? 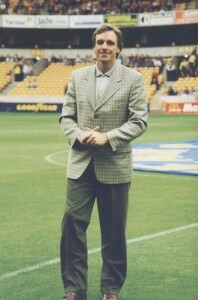 A: At Wolves, Graham Taylor came after Graham Turner. He did a great job at the club and was responsible for developing the Youth Academy. I thought he was a brilliant manager, similar to Graham Turner – very professional and very organised. You knew exactly what he wanted you to do. He explained it to you. There was no reason to say I don’t know what I’m expected to do. Then there was Mark McGhee and, unfortunately, we had a bit of a fall-out and I left the club. I went to Tranmere in 1997 with John Aldridge as manager. I’d been at Wolves for 11 years and was gutted to leave, especially under the circumstances. However, I had three great years at Tranmere, who were a good club and reached the Worthington Cup Final, where we unfortunately lost to Leicester 2-1. David Kelly and Paul Cook were there with me. They had a decent set-up, a good squad with a mix of youth and experience. I left in 2000 and joined Cardiff for a year and a half. 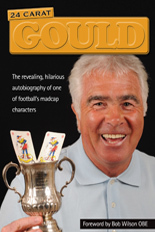 Bobby Gould was the manager. That was where I had the second hernia problem. It was a lot worse than the one I had at Wolves, where I was out for five weeks. The one at Cardiff put me out for three months. In my comeback game, in a Welsh Cup match, I was tackled from behind and did the ligaments in my ankle. I was in plaster for three weeks but I finished the season in the team. We finished second in the old Third Division and won promotion. However, Bobby Gould left and Alan Cork came in. He phoned me and said I wasn’t part of his plans, without me even playing for him. I had another year on my contract but they wouldn’t pay me off, so I went in every day for training without being included with the first team. This went on for about six months. He wouldn’t put me out on loan. Then Lennie Lawrence came in and things changed. He said the club needed to offload, which was fair enough, and let me go out to Shrewsbury for the rest of the season. I then signed for Shrewsbury for the following year before I finally packed it in. A: Floyd Street would definitely be among them. I also played with Steve Froggatt when he was left-back and I was right-back. He’s another. For what he did for the club, at the time of his career, I’m also going to say Ally Robertson. I know he was coming to the end of his career but the way he went about playing, with his experience, he was a natural leader. 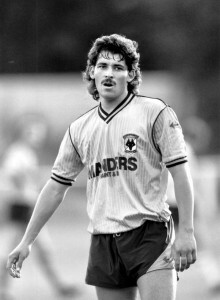 In the earlier part of my time at Wolves, he was a big part of our success. Floyd was a strong, quick lad while Ally read the game well and was a great organiser. It was a perfect combination. A: Of course, there was pressure. I think it was 0-0 at the time. David Kelly scored the other and I think he won the penalty as well. 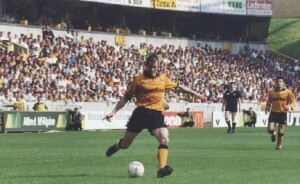 The match was at Molineux and I took the penalty in front of the Albion fans. There was certainly a bit of pressure and I was relieved when it went in. A: The Sherpa Van was brilliant; a Fourth Division team playing at Wembley in front of 85,000 people. I couldn’t believe how many Wolves fans actually went there, considering all the problems we’d had. There had to be over 50,000 fans following the club. It shows you how big the club actually are and what its potential is. It really hits you when you come out of the tunnel, you hear the fans singing and then there’s this sea of gold and black. And, of course, it was even better to win. I’ve been there and lost, so I know how it feels. It was brilliant, the whole thing, coming out of Wembley after the game and seeing the response of the fans. It was a great day. A: We had a good run in my early years with Wolves, although we lost the first three games I played in. Then we weren’t beaten until losing at Southend away. That game was to virtually decide who went up automatically, us or Southend, and then we lost to Aldershot in the play-offs. The following year, we stormed the league, and the following year did exactly the same. The only down to that second year was when we lost to Torquay in the semis of the Sherpa Van. We won 2-1 away, then lost at home 2-0. We thought we were there again. All my pals had their coaches booked for the final and Torquay were in the bottom three or four in the league anyway and we were something like six points clear at the top. Our best chance of promotion was probably in 1994/95, when we were challenging to get into the First Division in the last ten or so games. I feel we probably needed to strengthen the team, a couple of players just to push us on. We lost in the play-offs a couple of times but didn’t have things going for us. In 1995, we battered Bolton at our place in the first leg of the play-offs, but only finished 2-1 ahead. The result didn’t reflect our dominance of the game. They had one shot, from Jason McAteer, which flew into our net. It was just one of those days and you’re thinking: ‘We’re not going to win this.’ Then, at Burnden Park, McGinley elbowed David Kelly, and he should have been sent off. Everybody in the stadium had seen it, apart from the referee, then he goes and scores a second goals. Sometimes, you just need that little bit of luck, but it didn’t go for us at that time. The good times are still rolling! A: Put it this way, it’s getting more and more serious each year. Also, the players you are up against are getting younger. I’ve been involved now for seven years and there are players coming to the end of their normal playing careers who want to be involved, and want to win it. You can tell by their attitude towards the tournament. From our point of view, we’ve had a good run. The last couple of years, we’ve done all right but should have done better. Recently, there have been changes which I don’t feel are right. They gave Villa and Birmingham byes to the finals because they were being held at the LG Arena in Birmingham. We ended up playing in the Central League against teams such as Forest, Derby and West Brom, and lost to Forest in the final. The important part to the Masters is knowing how to play that type of game, and having a regular team has helped. There’s pride at stake, and all the players still have that competitive edge. That’s what being a professional footballer is all about. You want to be a winner, no matter how old you are. And everybody is the same in the Masters. There’s a handshake before you start but, as soon as the game starts, it’s very serious. Posted on: Friday, November 5th, 2010.